Last we left off I had planned to run in the evening and found out when the time came that I was not ready to barefoot run in the dark. So, I made a plan to get up reeeeeeallly early the next morning and get my run in. Well, it was also dark really early in the morning! Lol! Forgot about that. I guess summer really is over. AND, it was pouring rain all day. So, today I was going to run on my cross-training Kung Fu day. Based on the way it's felt after the 5K distance I've been running recently, I thought maybe I could do both in one day. It rained a lot on and off today, and I waited until there was a clear moment. I didn't like this because I was in my running clothes doing housework, getting "just one more thing done" and then looking out at the weather, and then "just another thing done" and looking out at the weather again. Finally it seemed right. My running partner -- Daffodil-the-dog -- refused to come out the door. She HATES muggy weather. So I went out by myself. I was actually a little nervous because I had heard one is more prone to blisters when the ground is wet. This was going to be my first day out when the ground was really sopping wet. Yes, I had been truly blessed all summer in that the weather had simply been ideal to break me in as a barefoot runner. Guess the barefoot honeymoon is over and there's going to be some rough going now. It turned out that it felt pretty good. I think I was running faster but it's hard to tell because I did not time myself. I passed a shod runner coming toward me and he said, "Barefoot running! You are brave!" But things got a bit uncomfortable towards the end when I had to go to the bathroom. 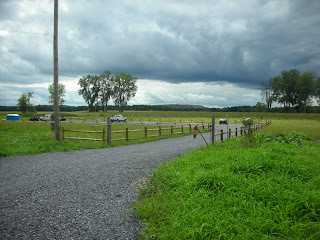 As I passed a spot where I could have headed home, I wondered if I should cut my run short and take care of that need. But I was stubborn and ran the extra 3/4 of a mile or so I had left. Well, this is the very first run that I felt horrible afterward. I actually felt sick. I always dislike it when running bloggers start talking about the issue of going to the bathroom. But it really is an important factor -- learning and how to manage, time, and deal with. In this case it made such a difference to my final finish. All summer long I felt so fantastic after my runs. I may have been a little tired. I may have needed to rest my muscles and let them recover some. But overall I would be flooded with good feelings. Today, however, I actually felt sick in my core. I think it was a combination of things, but mostly the extreme humidity. I was completely drenched, and I think Daffodil knew what she was doing when she refused to go out. Needless to say, I was not able to get to Kung Fu class. I am sad about that, but it's all in the process of learning. I think I do have a little blister from running on the wet ground too. All in all, however -- I still think it's all good! I have a full-day errand to run tomorrow so I was trying to figure out when I would run, since I usually run on Monday mornings. I decided I would run tonight, and was going to go out around 7pm as I have in the past when I've done night runs. As I was getting ready it suddenly hit me that I run barefoot now and it is dark outside. I'm not quite ready to go out in the dark yet. So, it looks like I'm going to have to get up at 5am tomorrow and run before the day gets going. This probably sounds really wimpy, especially after you read about Barefoot Josh and how he ran in the dark being chased by a devil! He wears a headlight in the dark. Wonder if I should get one of those? Winter is coming, so it will be dark for more of the day. Yet I haven't figured out what I'm going to do about my feet in winter yet. Vibrams? I don't want to stop going barefoot. “5K is old hat for you,” said my friend Robin after I reported this morning that I had run a 5K distance again barefoot. It sure did feel easy this morning. Only this past Sunday I was wondering if I would make it through my first 5K race since starting barefoot running, or if it would feel crummy bumping up the distance, and now two runs later 5K feels very good. My new barefoot running buddy came with me today. She’s going to be joining me on Fridays. As she asked me questions I was surprised at how the past months of staying consistent with my runs had accumulated to a little bit of experience. I was actually able to give little tips about things I had discovered – which I hadn’t realized I had been discovering – and point out little aspects of the route that needed attention. Like a guide who has trod this path before. Today, as I ran beside my friend, those sidewalks weren’t bothering me much at all and I may have even forgot how it was in the beginning if she wasn’t experiencing it right beside me. I felt a bit amazed at how I had developed. On the one hand, one has to be conscious of developing the soles of the feet gradually, but on the other hand – which seems to contradict it – the feet are amazing at making the adjustments they need. It seems like the skin on the soles responds pretty quickly to the demands. I’m amazed by it. I’m also amazed that I can run a 5K distance, come home and walk around my house barefoot. I’m amazed that I can go to an appointment in the city and when I get off the bus to come home at the end of the day, I don’t hobble down the street. I used to run the barefoot mile, run my errand to the city, come back, and be so embarrassed at how slowly I had to walk after I got off the bus. I imagined that someone was looking out the window at me feeling sorry for the crippled woman. It would be the same pavement I had earlier been barefoot running on and I wondered if I would ever get stronger. Okay, I admit that there are some weird looking specks there and I do not know why they are wrinkly, but compared to what I thought was going to happen to my feet when I started barefoot running, I am amazed at how they don’t get all beat up and horrible looking. I even took pictures of my feet before, thinking that they were going to change and get really ugly. They actually look way better than I ever thought they were going to look. Something else is happening. The pinky toe is starting to straighten out a bit. It had been kind of tucked under and leaning on the pads there. I thought it had formed that way from wearing a certain pair of New Balance walking shoes that was shaped that way. (First wrote about that here.) I thought that it was a permanent “deformity.” But in the past couple of weeks it has seemed like that pinky toe is getting stronger and starting to straighten out. I don’t think I’m imagining this. Wait! I remember I was going to write a post about that pinky toe and changed my mind. I think I have a photo I took of it back then. Let me go look. This picture was taken July 30 after a 1.25 mile run. Do you see how that pinky toe is all smushed up against the foot and not lined up over the proper metatarsal? If you compare to the above picture, there is definitely a difference. I do think the toes are starting to splay out as they should. My feet have been changing shape since then. I think it’s good. Inspiring Running Video: "My 120 Pound Journey"
I saw this youtube video the other day and think it is very touching and inspiring. Probably a lot of you have seen it already, but in case you haven't I'm posting here. I figured after successfully completing my first barefoot 5K this past Sunday that it probably meant I should try to run about 3 miles today. So I did. Felt easy as pie. When I checked my route on mapmyrun.com it was 3.19 miles. So it looks like I’ve done another 5K. Oh, I have to tell you that I saw another barefoot runner finally. I mean another barefoot runner who runs around here – something that I have not seen yet, though I know they must be out there. He was running with a baby in a baby jogging stroller. He looked like he was going along at a pretty good clip. I wanted to call out “hey"!” and cheer and say “I do that too!” But he was not close enough to me and was gone almost as soon as I had spotted him. I’m developing myself as a runner, and I’m cross-training in martial arts, and yet – as is so often the case -- there are so so many holes to fill in my all-around fitness coverage. I think it’s going to take me years to figure it all out. One big hole I’m trying to fill today is to add some squats to my routine. In the realm of everyday life, I have been wanting to be able to squat down. I have been having trouble doing this ever since I put on that 25 pounds when I stopped running last year and it affects a lot of things. On the blog Adventures of a Barefoot Super Hero, I saw pictures of the mom squatting next to her child. The loss of the ability to get into that position and use it in daily life is a handicap. Even though I can do a pretty intense workout at Kung Fu – more than I ever thought I’d achieve – it still is embarrassing that it takes me the longest to get up from the floor after we’ve been doing our crunches. So I have been thinking of adding squats – carefully – to my fitness plan. I have heard that developing strength from squats will help protect the knees as well. It was helpful watching the video, even though it’s a little hard to watch one’s self at first. I’m not exactly sure about squat form. I’ve watched some videos on the topic online. I know my knees should not come over my toes and it looks like they are in the video. I also think I may lean too far forward. My back is pretty straight but leaning forward on an angle. My squat plan is to work on the form and developing the strength to do just a few before I start putting them into sets of reps.
Well, today I was back to the summer routine. Blast the feet with the garden hose, and then sit and dry off in the warm sun. It’s little moments like this, in their simplicity, that have been part of the joy of becoming a barefoot runner this past summer. As a tribute to the last few summer-like days, I’ll post a few pictures I took at the height of the summer, of my post run water foot blast! When I first heard there was going to be the 1st Annual New York City Barefoot Run I was very excited, and of course I wouldn’t miss it for the world. As I read about all the barefoot personalities who would attend – including Barefoot Ted, Jason Robillard, Harvard Professor Daniel Lieberman, Movnat Founder Erwan Le Corre, -- I became even more excited and certain that I would simply have to attend. But when I found out it was on a weekend where I had a very important family commitment, I was so disappointed. Then came my DH to the rescue. Although I was committed to be somewhere on the first day – October 9 registration day when all the great free workshops and talks were going to happen – and would not be able to attend, he told me he would take over important-family-commitment duty on the next day -- Sunday morning, October 10 -- so I could slip over to Governor’s Island and participate in the actual running event itself. And what is even more exciting is that my new barefoot running buddy friend is going to come too, so I won’t have to make my way over there alone early in the morning. This race is going to be so much more beginner-friendly than the 8-mile Harlem-to-Brooklyn run with Chris McDougall was. In that run, even though they encouraged everyone – beginners to advanced alike – to participate for as far or as little as they wanted to run, it was a little tough just running a part of the run and then catching up with everyone at the end. It seems as if they have been very sensitive to this for the upcoming New York City Barefoot Run. They have planned a 2.1 mile loop around Governor’s Island, and the runners will be able to just do one or two or three or however many loops they can. 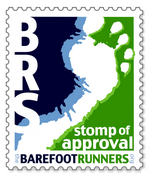 I love this aspect of the spirit of the barefoot running movement. Everyone is included, encouraged, and accommodated. The best runners would run right alongside the least in order to help them learn to love running too. And yet there is room for it to be competitive too. I think I will like doing the loop because I will not feel so behind everyone. I may get to actually run along with some people if they start to pass me the second time around the loop. I am really looking forward to it. Yup, you heard me right. I am planning to try to run 2 times around the loop. But it will be perfectly fine if I don’t get that far. I am planning to dedicate 1 mile of my running on that day to the 10-10 Virtual Race that Barefoot Neil Z is having to celebrate his 10-10-10 birthday this year. It’s only two weeks away! Stay posted! I will most certainly be taking pictures! My First All Barefoot 5K! I am pleased – very pleased – with the experience I had today of running completely barefoot in a 5K event. This 5K event happened kind of organically because we were invited by a friend. There was a 5K and 2-mile walk to support cancer research in honor of the man’s father who had died of colorectal cancer. Like all things barefoot, I got pulled into this. When I first took off my shoes to try out barefoot running, it was supposed to be therapeutic, to make my feet stronger so I would not be susceptible to reactivating my plantar fasciitis when I began running again. But, as regular readers of this blog know, I never put my shoes back on all summer. This was a nice little event. I came in last, as I knew I would, out of 76 runners. But I was very surprised to see my time at the end 45:37.6. A few weeks ago I wrote about how slow I was when I timed my miles running and they had been 17 and 18 minute miles. So, that’s a kind of encouraging development, especially since I felt that I was not working to run faster – not having any goal to run particularly fast -- and concentrated on form and running the whole thing like it was just a regular routine run for me. The people gathered on the most beautiful day you could imagine. I heard that it’s been this way for this race every time. I felt very calm and relaxed as I stood with all the people staring at the START sign. It’s not like when I was back running cross country and I was really supposed to try to be beating somebody and I would almost feel like throwing up while at this point. Knowing I’m on a personal journey and that this is for my own enjoyment makes a huge difference to being a competitor. As I knew would happen, everyone took off at the start really fast and I was left in the dust. This is the way I usually view a race these days, at the back of the pack. I am okay with this. I just focus on staying true to my own personal mission. Today’s mission was to just run this like I did any run during the week, concentrate on the barefoot running form, and finish the 3.2 miles – an added distance to the 2.75 I’ve run so far. Oh, and to enjoy myself as much as I possibly could. It wasn’t long before I came to the wooden planks I had been worrying about in my last post. I was carrying my Vibrams just in case it looked splintery, but – yay! – it was smooth and worn. No need to interrupt my run. On the wooden-planked boardwalk, I could hear much better how heavy my step was. I could hear my heels landing heavily and it was very helpful to adjusting my step. I was pretty much all alone now, but I could see some runner weaving around on other sections of the course. This course was going to be a double loop. The 5K runners set out first, and 20 minutes later the walkers were going to start their 2-mile walk. The walkers were going to do one loop. Well, it just so happened that I finished my first loop around the same time as the elite runners finished their second loops and around the same time the walkers started their 2-miler. So, I was near the finish line and got to see the fast runner win the race and the walkers head out. It was kind of cool because I was the front runner of all the walkers and that kind of soothed my ego a little bit. Being the back of the pack for the first loop was over now, and I now could see things in a better perspective. I was front of the pack for the walkers, and I came in ahead of all but one real power walker. But I realized that she was on her first loop and only had to do one, so if I was fresh, she probably wouldn’t have finished ahead of me. BTW, she was only a few feet ahead of me, so I could have pushed myself and tried to “beat” her, but that wasn’t what I was there for, AND I did not want to hurt myself or do something that would set me back from the way I’ve been progressing. 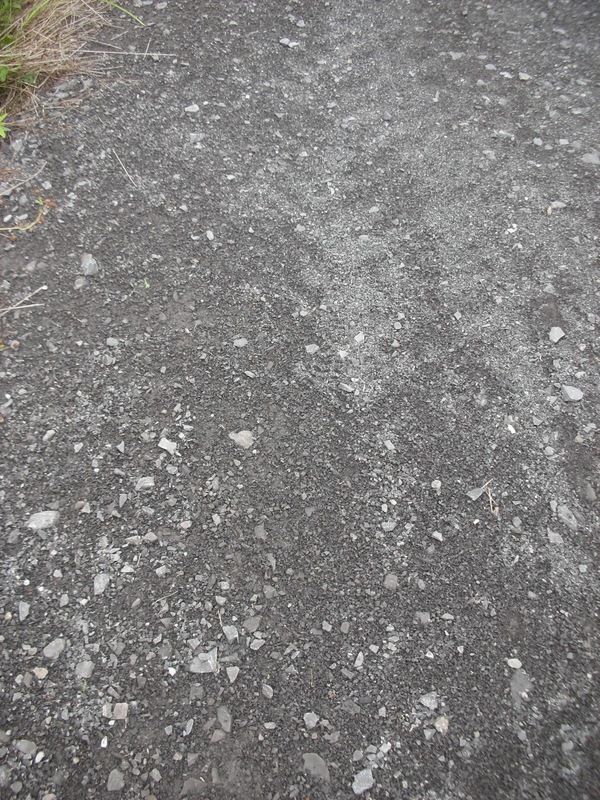 I forgot to mention after Wednesday's run that I added a little asphalt section to my run. I added about a 1/4 mile of asphalt, which today I extended to about 1/3 mile. I cannot believe that the asphalt is starting to feel fine. I ran 1/10th of a mile short of 3 miles today. So I think I'm ready for my little 5K event this weekend. About this 5K: The official word about the event is that it is "USATF certified, partial double loop, out and back on paved waterfront paths." However, I saw a photo from the 5K course last year, and some people are walking on a section of wooden planks. Here's a picture of that. The wooden part looks like it goes on for a long time. In fact, I just checked 3D Google Earth Map and I can see a very long section of boardwalk. I think I'll bring my Vibrams for that part. Now I wish I had put those Vibrams back on at least one time over the summer. Maybe I'll just run in my Tevas over those wooden planks. I'll only use something if the planks are not smooth and look splintery. I experimented with the turnaround spot I wrote about in my last post, the spot where my dog Daffodil started going a little nuts last time. It is a big circular area and I usually circle to the right. Today I decided to circle to the left to break the association she has with that corner. I kept my mental energy going forward, as if I was not going to turn around, and then when I got to the corner, I circled clockwise, instead of the usual counterclockwise. She did get a little excited -- but the "old" kind of excited -- and jumped up once, but did not bark annoyingly. I gave her a little freedom to lead and she settled down immediately. For today, that did the trick She was way less out of control, but I did have to let her run ahead of me, and that can be problematic over time if she starts to think she's in charge of the run. It was the best I could do for today, however. I'll keep working on it. I have taken advantage of the fact that she's trying to go faster. I let her pull me, so I can have that falling feeling better. Instead of the motivation to move my feet being to propel myself, I am letting Daffodil pull me so I have to lift my feet to keep from falling. Even though I read in the books that my feet would adjust; even though other people had done it; and even though I could even feel improvements from run to run, I have to admit that I do feel absolutely amazed at the way my feet have adjusted and grown and developed over the past summer. It feels like something of a miracle to me. At the beginning of the summer, my feet would start to ache toward the end of the day and I had to wear something in the evening. There was no way I was going to do any extra barefoot whatever on the same day. Well, even though I was told it was coming, I am marveling that I have now reached a stage where my feet feel good on the same day as I ran. Yes, they feel good enough to walk around barefoot. The pads on my feet have become more cushion-y and I don't feel like I'm walking on my foot bones any more. Yesterday I vacuumed in my bare feet. Barefoot Mile Number 58 -- All Systems Go! I stuck with the new increased 2.75 miles today. It felt like a piece of cake. Now I've got one more run before I try out that 5K I'm signed up to do with my family on Sunday. It's getting chillier. There's a wall along the sidewalk I run on. In the summer, running in the shade from that wall was a relief from the heat. But now it's cold on that section. I ran on the part the sun was shining on to warm my feet a little. Daffodil, my dog, was able to stay in the shade, which she prefers. Fall is an interesting time for a barefoot runner, I'm noticing. The little trees are dropping all kinds of little nubby things -- seeds and leaves and little prickers. The light of the sun is shining at a different angle that kind of makes it a little harder to see. I could definitely feel it in my legs as I warmed up the first mile today. We had sparred last night at Kung Fu. I had taken a little summer break from Kung Fu (a couple of weeks) and have been getting back into it. But on top of that, I have not sparred much. I don't like sparring and I sometimes forget to bring my sparring gear. I prefer to work on the forms and learn the self defense techniques kind of as a solo discipline. Well, we kept changing partners last night and one of my partners was a "circler" making our little pair go round and round. He was punching and I was defending. I was trying to stay "bladed" in a kind of forward stance, but I'm not that well versed in any kind of footwork, so I was just moving around any way I could figure out how to move around, while concentrating on keeping my arms up and blocking punches. I could feel as I was running this morning that my legs had been tense and had that extra roundabout workout. I mostly just tried to relax. In fact, the barefoot running mentality was present and affecting my sparring last night. I was way more aware of tension and I just knew the answer to good reaction times was going to be relaxation. In fact the more I focused on relaxation last night, the better I was at deflecting the attacks. Yay, barefoot running for teaching me to be looser. Ever since Daffodil was a puppy, I've taken her along with me for my runs. I think that dogs need regular vigorous exercise to stay healthy and there is no one else in the house who's going to do this for her, so I've got to take her with me. The added challenge of dog management sometimes feels like a burden to my running. I've tried to just accept it and take it as another aspect of my form to juggle and figure out. I really love running with her, but she's a high energy breed and very small and wants to go faster. I gaze longingly at those dog leashes that attach to the waist for hands-free running with your dog. But I have not been able to get her to just run along with me nicely. I'm afraid if I get one of those hands-free leashes she will be all unwieldy and run in front of me and trip me. Actually, on the way out she runs with me nicely. She runs right by my side, to the right and a little behind me. The leash is slack -- in fact I can hold it lightly with two fingers. It's when we get to the corner where we turn around that we have problems. Ever since she was a pup, once we get to the turnaround, she gets very excited and wants to start sprinting home. She pulls on the leash and it's that way all the way (for about a mile). I am very insistent that she stay by my side still, but I'm doing it by force and I'm holding the leash tightly, and it affects the relaxation of my arms, and they don't get to swing as naturally. I have even speculated that this problem may have contributed to getting plantar fasciitis last year. Well, recently -- the past two runs -- this excitement at the turnaround point has escalated and she now barks in a high pitched bark and jumps up on me very excited, like when she invites another dog to play. The first time it happened, I was taken aback and not sure how to handle it. I just put my knee out so she couldn't springboard off of me and I just ran until she calmed down (a couple of hundred yards). But people were looking at me and it looked like I did not have things under control. Because I didn't have things under control. Well, today at the corner, she did it again. Uh-oh -- I thought -- this is going to be hard to break. Today my strategy was to stop every time she barked and stand still and completely ignore her and refuse to proceed until she was quiet. Each time I started up, she barked and jumped again. I had to do this several times. A man jogging with his very calm dog passed me. People who have calm well-behaved dogs usually steer clear of dogs that don't look like they're in control of themselves. I know because usually things are going somewhat well with my dog and I don't like passing the really hyper-excited ones because they can be unpredicatable. It killed me to be out there in my bare feet with this hyper looking dog. But I had to live with it. As usually happens, she calmed down once we were underway for the journey back, but I'm concerned about this development. I didn't like stopping running when it had been feeling so good. Once I get to that corner I'm pretty warmed up and have a good rhythm going. But if I don't stop and figure out how to solve this turnaround dog problem, it could get even worse later. Gotta' nip it in the bud. On the way out I ran into yet another mom friend (another experienced runner) who was out walking her baby. This was during my barefoot walk prelim. She mentioned the bare feet. She expressed her concerns about the dirty stuff on the sidewalk and how that prevents her from giving barefoot running a try. I know -- I told her -- I read about this for 8 - 9 months preceding and just wouldn't try it because of that very reason. That's why I bought the Vibrams first. I only took my shoes off to learn the form better and get the feedback from the soles of my feet. I haven't put my shoes back on since. You know the story. She told me that she has a friend who has been running all her life and knows everything about running. Her friend's mother even owned a running store. I mean, how much more running a person can you be than that? Well, this friend has -- after running all her life and now in her 60s -- developed knee problems. Many people are telling the friend that she should try barefoot running. The friend responds something like "Hey, I'm old. If it was the shoes, it would have happened long ago." When my mom-friend was done telling about her running friend, I agreed with her that someone like that probably knows what's happening with her body. Yet I do think that it might be worth a try. I mean, what does she have to lose really? If it works -- great! She finds a way to run into old age. If it doesn't -- c'est la vie. Towards the end of my run I passed the guy-who-had-been-running-with-calm-dog (mentioned above) on his way back. By now Daffodil was running nicely by my side, so I was glad to get another chance to look competent. As the guy-with-dog runner passed he smiled and asked "How's the barefoot running working out for you?" I called out "I love it!" He said, turned around and running backwards because we had already passed, "Did you read Born to Run? " "Yes -- and I even got to run with Chris McDougall!" Well, he gave me the thumbs up and then we were too far apart to continue conversing. But it just seemed like one of those nice moments where you feel somewhat cool, rather than clumsy and dumb! Gotta' have a certain number of those moments in life too! 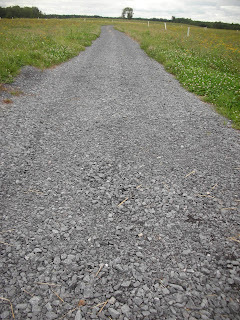 As I set out today, I had gravel on my mind. 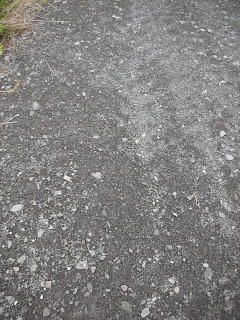 Gravel because I had read Neil Z's post this morning about how he was going along all fine and dandy in his race when he came to an unanticipated section of gravel. I know it was kind of predicament for him, and it probably hurt a lot to run on it, but there is a comical aspect to it. The kind of funny that you realize later, when you look back at it -- that it was all part of gaining experience with barefoot running and racing. But in the moment -- ouch!! My running surface is very smooth, but as I've added distance I've veered off into neighborhoods with more regular sidewalks. Some of those sidewalks can be pretty rough, especially the kind that have the nubby set-in stones. As I gingerly ran across this stony kind of sidewalk I was thinking of that gravel and I realized that these sidewalks were kind of like a soft "intro to gravel." It's kind of a controlled gravel, set in the cement. It doesn't move around and it's gotten a bit smooth, but it still gives a kind of introduction to the unevenness and the way gravel digs into different sections of your feet and hurts. 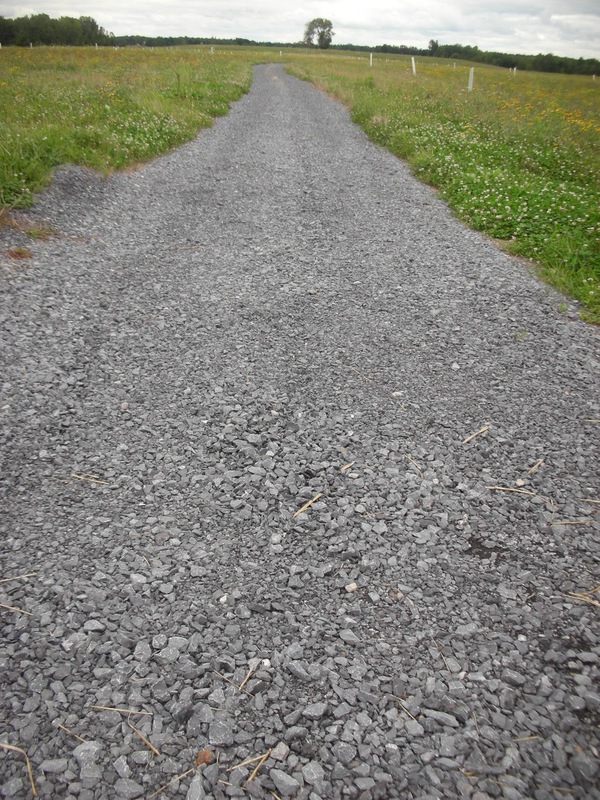 It might be a good to pre-train on stony sidewalks like this for a while before attempting to run on gravel. Nuh -- uh! It ain't happening. I wasn't even sure if I would have been able to run on this in my Vibrams even. The stones were sharp hiking around in my Tevas. But, that was a few weeks ago. Back to the present now. I felt very good bumping it up to 2.75 miles today. Towards the end, I could feel it a little bit in the top of my thighs. I think I forgot that the rest of my body -- the bigger muscles -- got conditioned for The Barefoot Mile faster than my foot, ankle and calve muscles and were kind of hovering in the background okay, along with the cardiovascular side of things. All that time I was waiting for my feet to catch up, and once they did, I'm proceeding on. I almost forgot that the rest of me is going to have to condition for further distances as well. So, oddly enough, my feet and everything else felt good at this increase, but other body muscles need to gain strength too. It seems almost like "everybody" is together now, and that the feet are not lagging behind the running in general anymore. Hard to say for sure, but that's what it felt like. I definitely felt like I could have kept running, but stuck with my plan. I will be participating in that 5K race I mentioned this Sunday, and I'm almost sure I'm going to try to run it barefoot. Mostly because I haven't used my Vibrams all summer and I'm not sure what would happen if I just went and ran 5K in them. Maybe I'd get some kind of Vibram blisters or something. 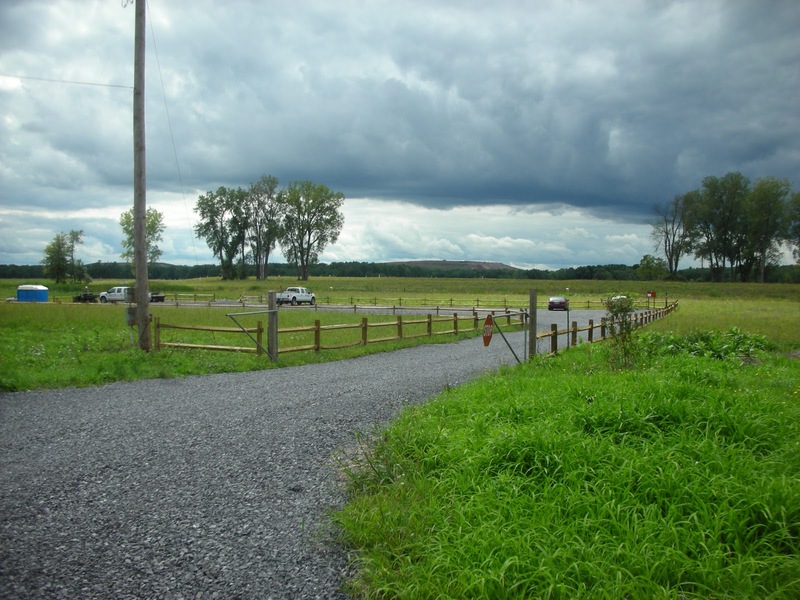 The event description says that the race will be on "totally waterfront paved paths." That does not sound like asphalt to me. I should go check it out ahead of time, but I kind of don't have time to get over there this week. I wonder if I could see the paths from Google Earth or something. There's a cool web site idea for barefoot runners. A Google-Earth-type terrain view of all races, so a barefoot runner could figure out his shoe strategy from the comfort of his computer chair! Now that winter is coming, I should do some training in the Vibrams or another minimalist shoe. I will need to have shoe options as I go forward with this. I --- just --- don't --- want --- to --- put --- my--- shoes--- back---on!!!! It was back to school this week, and outside the school this morning I saw one of my mom-buddies. She told me she saw me out barefoot running the other day and she told me that she thought to herself "I want to do that!" I told her I was going out right now and she decided to ditch her gym routine that morning and come out with me. She had been reading about it and wanting to do it but was a little afraid. She just took the plunge. Well, I gave her pointers by telling her everything I knew about barefoot running so far -- which isn't all that much. She was in good shape and a runner already. She had been thinking about the barefoot thing a long time, and I had sent her an article on the vibrams way way back when she and I had been talking about plantar fasciitis (she has it too). So, she had already been doing some of her gym routines barefoot and had tried some barefoot running on the beach while she had been on vacation. She walked the first quarter mile with me and Daffodil the dog, and then we ran about 1/2 a mile. I advised her to take her shoes with her just in case. She was a natural at it and she's in great shape. Even though she looked fine to me and she felt really good, I advised her to put her shoes on after the first 1/2 mile anyway, because it's part of my nature to be careful when starting out, and she told me she had some athletic activity scheduled for the next day and I didn't want her to be sore for that. She ran along with me for the next mile in her shoes, but she already was bothered by the heel of her shoe and the arch support. She seems to be very naturally inclined to this, and very sensitive already to what her body was telling her. It took me a few weeks to start being bothered by my running shoes. After a mile she told me she was going to take her shoes off again, and we finished up the last mile barefoot. She was running pretty fast, and sometimes went up ahead of me and then ran back. She reminded me of those barefoot running angels I had next to me while running the Harlem to Brooklyn barefoot run with Born to Run author Chris McDougall. last month. Okay, well, she's a natural and she's really fit and she's starting out ahead of where I am. But that's okay. I believe in my approach and I believe that where I'm at is right for me and I am growing every day. I think one important aspect of my own barefoot experience is that it is imperative that I remain true to myself and respect my body where it is at and allow my own progress to unfold at the rate that it needs to naturally. I lent her two of my books -- one by Jason Robillard about barefoot running (because I had two copies since I just got the new edition of the book that just came out), The Barefoot Running Book: A Practical Guide to the Art and Science of Barefoot and Minimalist Shoe Running , and the other by Daniel Howell about barefooting in general, The Barefoot Book: 50 Great Reasons to Kick Off Your Shoes . The great news is that she loved it and is now going to join me on my barefoot runs every Friday. I even told her that I would love to get a barefoot running club going. She said that now is the time to start thinking about it to get it set up for the warm weather in the spring. She also said that she knew where there is an indoor track we could use for winter running. So, it looks like I have a new barefoot running buddy. I hope I can keep up with her! Celebrating my 50th Barefoot Mile! It's got to mean something. Hitting my 50th barefoot mile today. I'm not sure exactly what it means, but 50 always seems like such an important number. It's got to be some kind of milestone. Something golden! Today's 2.5 mile run felt as easy as pie. I even tried to add little "speed" sections (probably meaning I sped up to 15 - 16 min/mile pace for a few yards, lol.). The really great thing about today was that my feet are not sore and do not ache now an hour after I've finished my run. Usually they feel pretty good immediately upon finishing, but after sitting and resting in a chair for a bit (usually to write this blog) after getting up they will hurt and then I will feel residual soreness on and off until they "recover." Usually by about 12 hours before I'm supposed to run again they've recovered completely, so the every other day running schedule has been just right for me this summer. But right now, the feet feel great. I'm walking around my kitchen barefoot and not even feeling like my feet just ran outside on the hard pavement at all. It feels like somewhat of a miracle, if you ask me. This is good! It's just gotta' be. Last time, I wrote about relaxing my toes. I thought that it was going to take miles and miles of running to deal with the tense toes issues but I was very surprised at how well my feet took to relaxed toes and how easy it was today. I think they really liked the way relaxed toes felt, and wanted to run that way. Running on various surfaces, asphalt, pavement with set-in bumpy stones, different kinds of uneven tile -- all of it was much easier with relaxing the toes. Sometimes when I go to fix something in the running "form" it takes a long time to fix it. One reason is that once one set of muscles that had been strengthened by the "old way" get deactivated, a new set of muscles gets activated that wasn't participating in the "old way." It can take quite a bit of time and repetitions for the newly activated muscles to get up to snuff. But in the toe relaxation case, all the muscles seemed to like the adjustment right off the bat. Good news. It's nice when there's an easier fix, just for a change of pace. For someone who runs at the back of the pack, I do a lot of contemplating the idea of speed. People always say "thinking is not doing." In the case of speed maybe I prefer to theorize and think about it rather than actually try it out. Today I was thinking about how motivation affects speed. A couple of years ago, when I would be late to get out for my walk, I had to hurry and get it done in time to get to an appointment. I would walk much faster because I had an internal motivation for speed. In those days I also used to contemplate speed while walking (also instead of doing it) and I remember imagining how I would walk if I was trying to get to my parking meter before the meter maid did. I would speed up and walk like I really meant it. Having the motivation made a difference. I don't really have a motivation to go faster right now. But if somewhere I encountered information about what I might get out of trying to go faster, it might make me more interested in speeding up. For now, however, I'm content. Okay, so not knowing why on earth I would want to go faster (except maybe to get to the finish line in time to get one of the free handout snacks, and before everyone packed up and left the area so I could still feel a part of everything), I started to strategize in my mind how I might go about improving speed. My first thought was that I would add little segments of bursts of speed. I think I remember reading in Jason Robillard's book -- The Barefoot Running Book: A Practical Guide to the Art and Science of Barefoot and Minimalist Shoe Running , which just came out with a new edition -- that he would run as fast as he could until he couldn't go any further that way and then slow down to an almost-walk, and then he would begin all over again once he was rested up. Having that thought in mind, I figured I might do something like that, only not run as fast as I could, not want to feel that much pain -- only a little more pain. Would I run faster for a set amount of time and then slower, like run fast one minute, rest one minute? Or would I just run faster until it felt like I should slow down and rest -- the "listening to my body method." Would I start out with the "speed" work right off the bat, or would I run a regular mile and then do the speed work during the second mile? I pondered these and many other questions as I ran along. Not that I am necessarily going to do this, mind you. Just in the thinking stage right now. Thinking is not doing. And we all know that once you start doing something, all your theories get revised. I went out a little late today because I thought it was cooler out. But it actually got a little warm and heated up the tiles in the sidewalk for me and the ground was hot. It did not bother me too much while running, but when my little dog Daffodil stopped to do some business, I felt it and had to keep picking my feet up and running in place while cleaning up. As I did that, I thought that maybe it's good to have a hot surface because it helps with that picking up action. I realized that it had been a long time since I've brought my flip flops or vibrams along "just in case." I guess that's not a good idea, because as I headed out, I remembered that there was a long hot stretch on the way back that could be tough on the way home, and I began to worry that I wouldn't have anything to "save" me if it got too unbearable. I made a mental note to make sure I had some kind of flip flops with me on hot days. It turned out not to be an issue, however, because once the dog was done, it was movement all the way for the rest of the run. As I ran along, I could feel my toes scrunching up a little. That's been happening when I walk barefoot in the house, especially in the left foot. I think I'm doing it to keep that second metatarsal bonehead protected. That works against me because as I try to find a good stepping place, and step lightly, I can't default to scrunching my toes as the solution. Toes have to be relaxed so I find the better solution. I've read so much about how relaxation is key. I think I've got my calves and ankles relaxed pretty well. I think I've got all unneeded contributing parts relaxed pretty well. But I'm now working on relaxing the actual feet themselves. It's tricky with the feet themselves, because since they are being stimulated by sensory feedback from the ground, it's hard to tell is something is tense or not, especially my arches. My arches have felt a bit stiff, and now I felt the toe scrunchies. It felt better and better as I relaxed my toes. Relaxing the toes seemed to help the rest of the foot relax too. My foot started to mold itself to the ground better, especially when crossing the streets on the asphalt. I think it was good. At one point something troubling happened today. I heard footsteps coming up from behind, and then a person who was walking passed me. Now, I definitely am slow -- how slow I am can be found here -- but I usually am consoled by the fact that I pass most pedestrians and fitness walkers and leave them way behind on the sidewalk. So the fact that this pedestrian passed me hurt my ego a little bit. But then I saw that he was heading over to take in the view and was not out for a fitness walk. Maybe he was booking it over from his parked car for a quick scenic stop. But for the few yards or so I was behind him, I was trying to ascertain why he was faster. My cadence was faster than his for sure, so I figured he must have a longer stride length. He only looked a little taller than I am, but I cannot see my stride length. I have a feeling my stride length is pretty tiny, based on how it feels. I'm afraid to make any bigger a stride length than I am because I don't want to heel strike and I don't know how to have a long stride while barefooting yet. There were tons more people walking the boulevard today. I guess it was because it was a holiday. Many of the people I passed were smiling (laughing?) at me. 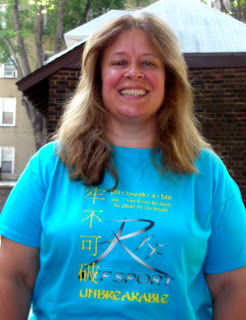 I was wearing my new RKF Sport "Possibility T-shirt" Maybe it would put a smile on someone's face to see someone running barefoot wearing the word "Possibility." I ran a bit longer today. I hadn't planned to increase distance, but it just felt so good and I wanted to keep going. I ran 2.5 miles without a problem and really felt I could have gone further. When I first headed out to start running again last spring, it was after six months off to heal a bad bad case of plantar fasciitis. I started running when that injury was about 95% healed. I took a chance. At that time I didn't know if this barefoot theory and anecdotes were accurate and there was a chance that running barefoot was going to aggravate the condition. I was going against conventional ideas about plantar fasciitis, which encourage a person to avoid going barefoot while healing. Well, I am happy to say that the plantar fasciitis is more than 100% healed! I say "more" because not only is there no sign of that old injury lingering at all, but I feel my arch has gained strength. As I ran along the 2.5 miles and finished up feeling really great, I've been thinking about the Possibility of running that 5K on the 19th that I wrote about in this post. I think it's a possibility, and even a possibility of running it barefoot. I used to be a golfer, but now I only get to golf a few times a year. After I get out golfing, I always say I'm going to start going to the driving range regularly and regain my former skills, but I never do. I think I've mentioned that before. I also think I've mentioned that when I was young I used to golf barefoot. Well, tonight I did get to the driving range, and again I didn't really want to put on my old running shoes, and just went to hit balls in my Tevas. I kind of figured it didn't really matter what I wore because we were just going for fun. But I saw this pair of golf shoes on a table in the pro shop on sale and I almost bought them. They were kind of different and they looked really comfortable. DAWGS Golf Shoes. They looked like crocs a little bit, and I thought they might be easy to just slip on for those times I hit the driving range or went out for a round of golf while visiting my dad. Well, I got into a discussion with a knowledgeable person about it and I learned from this person that a golfer needs stabilizing forces, and that any croc-like shoes might not have these stabilizing forces which are good for the golf swing. This sounded so much like the claims for "motion control" made by running shoe companies that are being challenged and questioned, that my brain jumped to start to wonder if some of the claims of the golf shoe companies will be examined as well, as part of this whole minimalist shoe movement. In fact, I wonder if the spirit behind the barefoot running movement will pervade other sports soon as other player seek to find freer movement. I began wondering if people wearing golf shoes got more injuries or less in golf shoes. So, when I came home, I just googled around a little and I found a couple of interesting pages. Most of it is anecdotal stuff and not anything research-y or scientific. One of them was in a blog post where the golfer has been wearing Vibrams to golf and feels that this minimal shoe has been helping his golf swing. Another one was in a blog where the blog author accidentally tried golfing barefoot and found it to be beneficial. A couple of the commenters on that post mentioned they had golfed barefoot too. My knowledgeable golf friend says that golf is different than running because golf is an unnatural motion and needs a stabilizing force to help with the swing. But in some of my random readings tonight I read that some golfers think the toes may make some stabilizing contribution, once they are freed from the golf shoes. Here's a discussion I found on a golf discussion forum where the poster is kind of pondering the same questions I am here. One of the posters there left a link to this very good article about barefoot golf that finally explains that being barefoot may help achieve balance in the golf swing. It seems that the feedback the feet get from the ground aid the proprioception of the golfer. Again, nothing scientific yet, but getting closer to a potential theory as to why some golfers say they are experiencing performance improvement when they try swinging barefoot. And from this forum I got a link for what I was looking for -- Aha! -- minimalist golf shoes: True linkswear. I wonder if someone will begin to study it? Will we find out that golfers in golf shoes have more injuries than golfers who are barefoot? I wonder! Something very ridiculous has happened. A fellow barefoot blog friend, Neil Z, has tiptoed over the cyber-space between our blogs and tagged me in a cupcake game. Now, let me tell you, I had another blog for a year, and I never encountered anything like the fun and games going on over in barefoot blogland. No, I was over in music blogland. Although I was trying to be somewhat serious over there, I admit that sometimes I was a bit of a clown in my attempt to free myself as a musician and not take myself so seriously. I'm not sure whether my music blog over there was respected or laughed at, but at any rate, I have enjoyed the past year of posting and interacting with the readers of that blog. But I had no idea that over here in barefoot land they were having all kinds of contests and give-aways and playing cupcake tag late at night in their bare feet. In fact I thought barefoot people would be very serious because they'd all be worried about stepping on pieces of glass or something. I am realizing that once you take your shoes off and start feeling the ground, a very silly side starts to come out. Or was the silly side there anyway and that's why it was easy to embrace running barefoot? So, to be more playful, should I actually indulge in this cupcake tag game? When you are a barefoot runner, you do feel quite alone at times, and it does feel good to connect with everyone. But if I don't play the cupcake game, can I still be in the barefoot club? I mean, I am pretty serious person in a lot of ways. I don't play farmville on facebook, or poke people, or look for easter eggs. I play serious word games: scrabble and lexulous and that's about it. But I find those word games very fun. I just had no idea about the blog games. But ... but .. what if ... what if one of my serious friends comes over to my barefoot blog and sees me running barefoot with pink cupcakes in my arms all over the internet? I just love the new martial-arts inspired T-shirt that I wore today for the first time. Yes, this is a product endorsement, but not one I'm getting paid for. I ordered this T-shirt from RKF Sport. I'm giving this company a free endorsement on my blog. Mainly because my blog isn't really about making money. It's about expressing my adventures. This T-shirt says "Unbreakable" in both English and Chinese Characters. That's what I would like to be, so I thought maybe if I ordered this T-shirt it would make me a little stronger -- ha ha! I'm so happy with this shirt and I love the sayings that are on this line of T-shirts: "Possibility," "Wu Wei -- Going With the Flow," and "Simplicity." I want to eventually get one of each, but for now I have "Unbreakable" and "Possibility." I bought "Unbreakable" because I have felt very broken at times over the past couple of years. I'm glad to say that I haven't felt broken because of anything truly devastating happening, but I guess I have felt broken by my own personality and my numerous failures to overcome my many flaws and make myself a better person. So, I like the idea of wearing "Unbreakable" -- that this discouraged state will not hold its sway over me. And I also love the idea of "Possibility" because it points to many exciting adventures awaiting each day. I definitely don't feel that this barefoot running adventure is breaking me. In fact, I feel myself growing stronger day by day. I set out to do my two miles today, and I started walking with my little dog Daffodil, and she was eager to go on our usual jaunt. However, it was near 100 degrees, and as we approached the corner, I felt worried that it might be too hot for her. So, I walked her back home. This young kid was trimming the grass that grows between the cracks in the sidewalk with this rotary trimmer on a stick. He didn't hear or see me coming and a tiny stone got flung from the trimmer right into my face and it hurt! Forget about the hazards of running barefoot -- there are many hazards out there we cannot even think up! After returning Daffodil I set out for my 2 miles. I came upon a lady runner whom I've seen out there several times. She was the one who passed me and called out "Get Some Vibram Fivefingers!" as she ran by. I've seen her out there other times since then. Earlier this week she called out to me "Where's your SHOES?!?" in a good-natured way. Well, today I saw her on my walking warm-up on the corner where I start to run. She was standing there and it looked like she had just finished her run for the day. She approached me and said, "I just have to ask you about what you are doing? You are out here walking and running barefoot. Why?" Um ... for a second I couldn't remember why I was running barefoot. I began to mumble something about plantar fasciitis and learning how to land on my mid-foot instead of my heel or something like that. It led to a pleasant conversation. She had tried the Vibrams and they had made her run faster, she said, but her feet hurt a lot the next day. She's a real runner, and I have read about when people who are used to running high mileages switch to minimal shoes they don't want to cut back in order to condition their feet muscles, tendons, ligaments, etc... She said that she had heard the recommendation to just do ten minutes a day in the beginning but she said, "Who wants to just run ten minutes?" I can understand that. It seems that I was in the right place at the right time (or something like that) because I had to start from scratch again. If I was a real runner racking up all those miles every week, I think it would be really hard to go back to the beginning. Especially if I was not really having any trouble with my shoes. One last item to think about today. A friend of ours sent us a flyer for a 5K race named after and honoring his dad who died of colorectal cancer. My husband, who never has wanted to go to a race with me, has said that he would like us to participate. He said he could do the 2-mile walk, and maybe I could run the 5K. The problem is that it is on September 19, and I'm not sure if that lines up with my Fall Fitness Plan. According to my plan, and my very conservative approach, I wasn't even sure if I'd be able to do the HoBOOken Halloween 5K, the one I signed up for on October 30th or not. Well, for one thing, I have been known to err on the side of being too conservative and careful. And for another thing I do believe that sometimes life events present themselves in such a way as to almost speak and say, "this is the next step; the next direction; go here." So, I am thinking that perhaps I will run my first 5K a little earlier than I thought I might. We shall see.